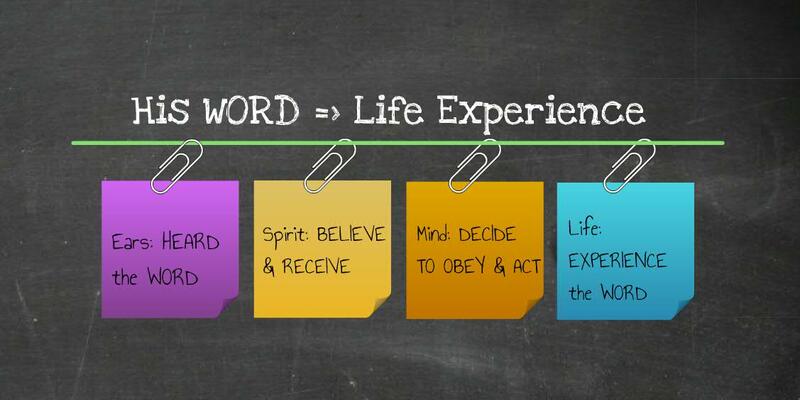 Whether our lives can stand the test of rain, flood and wind totally depends on how much we live a lifestyle of turning God’s Word into life experience. So where do we get stuck? I can only speak from my own walk. I get stuck each and every step along the way. But the good news is that we are not working this out on our own. God delights to help us. We just have to initiate the steps. [Philippians 2:12 MSG] Be energetic in your life of salvation, reverent and sensitive before God. That energy is God’s energy, an energy deep within you, God himself willing and working at what will give him the most pleasure. Stuck at Hearing/Reading/Intaking? Intake problems in spiritual life is analogous to starving or not eating in our physical life. It affects our health. If we do not eat often or eat enough to stay healthy, when attacks come, we just don’t have the stamina to fight. A Priority Issue: My intake problem is often a priority issue. But priority issue is a relational issue. A wife cannot keep putting off her husband and still expect a good marriage. In the same token, I can’t keep putting off spending time with God and expect to stay close to Him. I have to schedule Him in, first. 30 mins a day. I make it in the morning. In this bonding time, Holy Spirit often gives me Bible verses that speak to my soul, verses that are so spot on in timing, fitting in the struggle and personal situations. I just allow myself to soak in and come out of our time together in a refreshed and transformed spirit. I memorize and meditate on the Word received for the rest of the day. Eventually, the deepen relationship increases my spiritual appetite, making it more of a desire than a discipline. A Prejudice Issue: I notice that my intake problem can also be a prejudice problem. I only hear what I have already set my mind to hear and therefore I am not really listening. That is a real intake issue. I must consciously and intentionally empty myself in order to hear His Word for what He said and how He said it, not the version that I have already preconceived. I am often amazed once I surrender my thinking and presumptions, what the Spirit said brings joyful surprises. For example, I have a presumption that in John 21, when Jesus said to Peter to feed His sheep, somehow I have a preconceived notion that this message was only for those who were called into full time ministry. When the Spirit showed me that everyone in Christ is a kingdom priest and Jesus’ calling to feed His sheep is for everyone. It was eye-opening for me. Stuck at Believing/Receiving/Convicting? Watch out for our attitude of unbelief and filters made from lies. A Faith Issue: Even if we hear correctly, I often doubt. Is the sermon on the mount too idealistic to be lived in real life? When Jesus said in John 14:12 that the person who trusts Him will not only do what He was doing, but will do even greater things. Is He talking to me that I can do even greater things than when He lived on earth? Our mind already put up mental block and preclude certain Bible verses as too idealistic for real life. This is a big hurdle to receive the Word. When I come to these situations, I ask the Spirit to guide me deeper into that particular truth. Then I ask Him to help my unbelief. I also find that declaring the exact Word from the Bible to myself really help. From my experience, the feeling of believing will eventually catch up. I have to believe in order to receive it. I have to receive the Word as it is in my heart so that it roots in me with conviction. A Pride Issue: Our intellectual pride often inhibits our believing and receiving God’s Word as the way God intends it. We rather validate the Word with systematic theology text books written by men than to ask the Holy Spirit. I find that sometimes I desire people to see me smart so I demonstrate my intellectual muscle by engaging the Word theoretically, systematically, logically and intellectually instead of personally. That is pride. Pride puts my interaction with God’s Word as a third person. Instead of interacting God’s Word vibrantly with my soul, it detaches our engagement and stops us from receiving God’s Word in our heart with conviction. It is only to embrace His Word personally with a pure heart that I am ready to receive God’s revelation to me at a personal level. Stuck at Obeying/Willing to Act? This is the battle of lordship. Does Jesus really have the final say in my life? A Trust Issue: Obedience to the Word often pushes us to take risks and stretches our comfort limit. If I stand up for righteousness and as a result lose my job, who is going to bring in the money to pay the bill. But that is exactly the crux of the issue. If I don’t step out, how can see God’s Word come alive in my situation? My only option is to cry out to the Holy Spirit to be merciful and gives me more faith. A Thanksgiving Issue: A major and common problem of experiencing God’s Word in our life is that we are forgetful and ungrateful people. After God faithfully kept His Word, before we have time to take notice, acknowledge and say thank you, we have already moved on to the next “ASK”. Slowing down to take time to say thank you in acknowledgment of His Word in our life as testimonies is indispensable in living a life style of turning God’s Word into our first hand experience. A Worship Issue: We also need to have a habit of giving God glory for what He has done with His Word in our life and not take His credit to feed our own pride. Otherwise, we cannot have the eyes to see when His Word is lived in our lives. What about you? Where are you stuck? Are you like me, stuck each step along the way? Is there a particular step that you are struggling with the most? Please share with us in your comment and let us know how your walk is like! Looking forward to hearing from you! Previous Previous post: Rock or Sand. Next Next post: When Rain, Flood, Wind come, What Happen to the House?